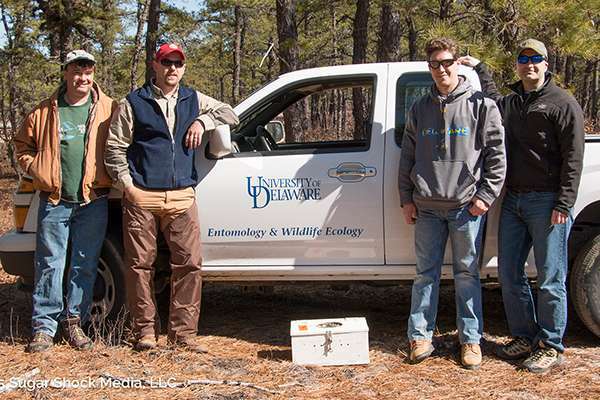 A UD team is helping restore the bobwhite quail to the New Jersey Pine Barrens. 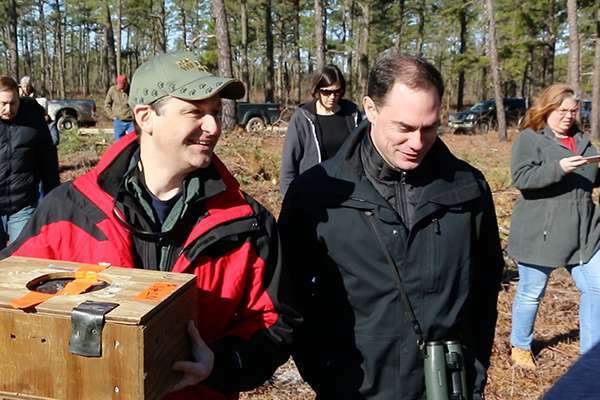 After virtually disappearing from New Jersey, northern bobwhite quail were reintroduced into that state's Pine Barrens on April 1 as the result of a three-year collaboration that includes the University of Delaware's College of Agriculture and Natural Resources (CANR). CANR representatives are working with Bill Haines, one of the nation's largest cranberry growers and New Jersey's largest landholder, the New Jersey Audubon Society, the Tall Timbers Research and Land Conservancy, and Bob Williams, owner of Pine Creek Forestry. 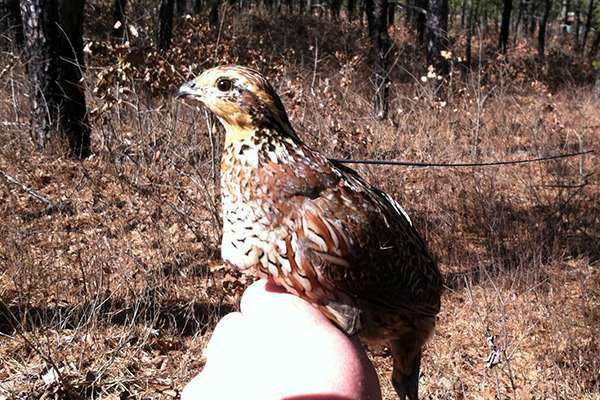 Eighty wild bobwhite quail were translocated from southern Georgia by Tall Timbers to Haines' property in the New Jersey Pine Barrens. This process will be repeated for the next three years, with 80 bobwhite quail being brought north and released every spring shortly before the breeding season. Chris Williams, associate professor in CANR's Department of Entomology and Wildlife Ecology and director of the Waterfowl and Upland Gamebird Program, explained that the bobwhite quail have been declining in New Jersey primarily due to the loss of suitable habitat with conversion of agricultural areas to suburbia in the southwestern portion of the state and lack of forest management in the Pine Barrens. "Over the last 40 years, the Pine Barrens have been devoid of forest management, such as thinning and burning, which naturally occurred in this region. As a result, the forests have become thick and unhealthy. This has promoted increased forest disease and low biodiversity – including the extinction of quail in the area," said Williams. Quail are known as an edge species, preferring habitats with a mixture of grassland, which they need for nesting and for night roosting, forest edges for cover, and, in some cases, agricultural areas for extra food. "At night they go out in the grass and are fairly well protected from evening predators," said Williams. "They also need escape cover and where you get a lot of that is right at the edge of woods or farmland corridors. They use that for feeding and escape cover during the daylight hours and during the winter months, depending on how far north you are, provide invaluable protection against bad winter weather." Bobwhite quail are carried into the Pine Barrens. While Williams initially researched bobwhite in the southwestern agricultural areas of southwestern New Jersey 11 years ago, he recently discovered renewed forest management practices in the Pine Barrens were providing an excellent mix of early successional plants within a thinned forest. The pitch and short leaf pine system has begun to mimic prime bobwhite areas in southeastern United States. 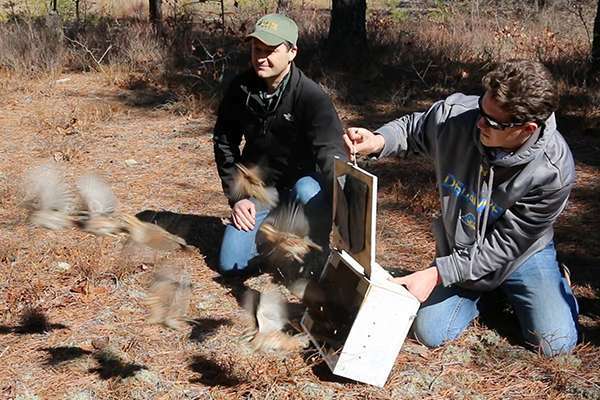 The quail for the study were collected in southern Georgia and transported in eight boxes with 10 quail in each box and were released over eight different sites located in about two and half square miles of managed forest landscape. "All the birds made the journey to New Jersey and they all flew out of the boxes very strong and healthy, which was great," said Williams. Williams said the birds were collected in groups of 10 so that when they were released, they would be surrounded by familiar birds who were part of their covey—a small flock of birds. "In the winter the birds form up in these coveys and it can be a mixture of related birds, or it could be unrelated, but they spent the winter together as a group," said Williams. The birds form groups for a variety of reasons, such as better detection of predators, better ability to find food resources and huddling up on the night roost to stay warm. Bobwhite quail are set free. By collecting wild birds and releasing them in familiar coveys, Williams said they stand a better chance for surviving in their new home. He also explained that because quail on average only have about an eight-month lifespan, they were released during the spring with the hope that they can breed and produce a sizable number of offspring before the winter. "They'll start to break out of these coveys and start to pair up for breeding around May. The best success for restoring bobwhite is right at this moment so you have the maximum number of individuals who can try to breed on the landscape," said Williams. "They're such a boom or bust species. Each summer, you have a mom and a dad and if they can get a brood of approximately 12 birds, you just need two of them to survive to the next spring and that's usually what happens." Williams said it is even better if bobwhite can get off two broods in one summer to better their chances of population growth over the next year, and he is excited to see how the quail will respond to the habitat in the Pinelands. Now that the initial group of quail have been released, Williams said that UD will oversee the project with two graduate level students conducting year-long studies on the birds. Kaili Stevens, who Williams just accepted as a master's degree student, will focus on the winter ecology and habitat use of the quail while a doctoral student who has yet to be selected will oversee the breeding season, survival, nest success and habitat use of the birds, as well as continue former songbird work Williams and his students have conducted in previous years. "Ultimately, we'll have a much better story about what this forest management means for avian biodiversity and conservation. It's a much larger biodiversity question than just quail," said Williams. "Those two graduate students are going to share responsibility and we're going to follow these birds 365 days for the next three years. No one has ever looked at quail in the Pinelands and over all the projects I've done in my lifetime, this is perhaps one of the most rewarding. "To go into an area where a species has been extinct for likely 50 years, conduct serious habitat management, and reintroduce the species is just amazing. This is truly a grand challenge and I am happy the University of Delaware's Waterfowl and Upland Gamebird Program can be a part of this effort."